// SERIOUS: Women also can be stylist with jackets! Today, we're going to talk about all of you. Yes, you, girl, women and what so ever. Seriously, you should know that jackets are something that must-have. Jackets can make you more gorgeous, interesting and elegant. Yes, you should try this! and yeah this dressing also can use for travel. Be simple but nice! It cannot be denied that jackets have their own stylish touch that allows us to transform our look instantly. It does not matter how sloppy we look or how plain our outfit is, with a simple jacket it definitely spices up your whole look. However, some women do not know which jackets are needed and a must-have. So for those who have no idea what to add into your closet at home, check out the three jackets for women below! 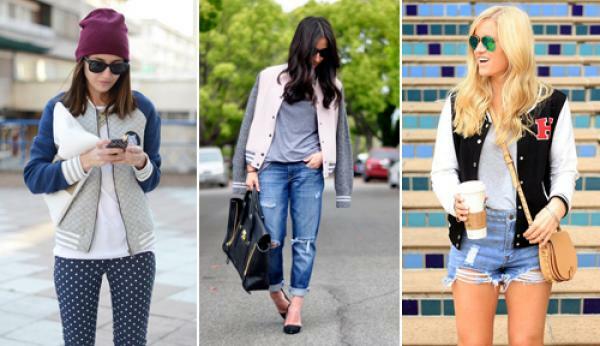 Every girl should own a denim jacket as it adds that trendy touch to your casual look. If you are having a bad day, throw on a denim jacket and feel that extra boost of confidence. Besides that, denim will never go out of style. If you want proof, look at how our jeans lasted since the early days of its existence. Leather jackets are to die for as no one can ever resist the stylishness it has. You should own at least one in your closet as it gives you that edgy appearance. Pull off that biker chic look whenever you feel empowered and flaunt it everywhere you go. Mix match it with jeans, palazzo pants, shorts or even dresses. The classic black jacket is among the favourite pick among women but if you prefer other colours such as brown for instance, go for it! When you hear ‘varsity’, the first thing that comes to your mind is college life! Yes, college life is fun and varsity jackets too. Even if you have started your own career, you can always go back to your memories by wearing a nice varsity jacket design. Be stylish by pairing it with a plain top, simple jeans and boots for the perfect ensemble. Hey, don't ever think that women cannot be like male huh! We also can be stylish as we want! Oh, wanna some more? Really enjoyed this entry? What? yes it's ZALORA guys! AWH YA I KNOW THEIR STUFF REALLY AMAZING. Okay, got to go. See you soon! Daahh!